The most exciting part of this week was receiving box after box of beautiful fabric as all the orders I made for clients rolled into my house. I so love fabric, and it doesn't even matter that it's not for me personally. I'm just so happy to get to work with it! In the mix: dark wash denims, heathered grey denim, Michael Miller Pretty Bird Ground Cover, Joel Dewberry Heirloom, some stretch knits from GorgeousFabrics.com (so that I can try my hand at some fancy tops for the spring/summer and add those to my repertoire), and the aptly named Happy Mochi Yum Yum India in Lemon (what a name!). Another lady responded with a lead for more, so I may soon have more fabric swatches than I know what to do with! Cutting patterns and fabric is my least favorite part of the process so while I'm disappointed I didn't get more done last week in terms of tangible finished projects, it is satisfying to know that all that drafting and cutting is done. I'm now poised to finish three skirts in the next three days! My other main sewing activity this week was reading Make Your Own Dress Patterns by Adele P. Margolis. I received a copy of the book for my birthday (my 42nd! Holy Cow, how did that happen??). It is wonderful. I read about darts this week and how to move them as a design feature or to enhance the fabric being used. Everything I read is super handy for what I do in designing/altering patterns for my clients. It inspired me to shift the darts on Diane's corsetted skirt so that they match the curve in the front/back seams. I'm so excited to unveil this skirt it in next week's What's Up post! In my Fabric Focus post this week I plan to focus on linen, so keep an eye out for that (Tuesday or Wednesday). Cheerio! 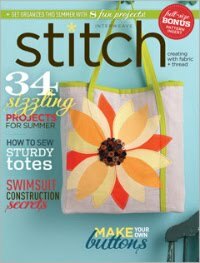 2 comments on "What's Up: Finished Bag, Lots of Pattern Drafting & Cutting, Oodles of Packages"
Love that penguin bag! It turned out so cute. The black and white circle print fabric was a good choice. Glad you like it, Melissa!